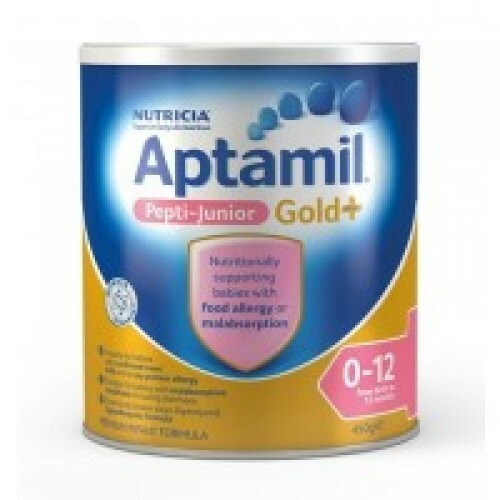 Aptamil Gold Pepti Junior is an all ages infant formula designed for the dietary management of formula-fed infants with confirmed cows' milk and soy protein allergy or malabsorption. It is suitable from birth onwards and when a partial or total breast milk substitute is required. Nutritionally complete for formula-fed infants 0-6 months. Or for use in a mixed diet for infants 6-12 months, and toddlers older than 12 months. A semi-elemental formula with extensively hydrolysed cows' milk protein which has been broken down to small peptides, so it is easier to tolerate and digest. Contains cows' milk proteins that have been broken down (hydrolysed). If you think your baby may have an allergy to cows' milk protein or soy protein but has not been diagnosed, please ask your healthcare professional for advice. Food allergies or malabsorptive conditions, such as diarrhoea, in formula-fed babies can be complex to manage and these babies may require a special diet. To assist in managing feeding tolerance and growth in these babies, the food component responsible for the allergy or malabsorptive condition may need to be avoided or severely restricted. Always speak to your healthcare professional for advice. Aptamil Gold Pepti Junior is not suitable for general use and should only be used under medical supervision. All formula feeds should be prepared immediately before feeding baby. Do not prepare gels, thickened feeds or thickened food in advance as thickness will increase on standing.